The Advertising Standards Authority on The Citadel greets every visit from Commander Shepard with a deep, disgusted sigh and a disdainful eye roll. The moment that guy sets foot inside the galactic nexus -- home to millions of aliens and bustling market to many more -- is when all the complaints start rolling in. Yeah, he's saved a planet or two, but the man's obviously a duplicitous douchebag who loves nothing more than inflating his ego through endorsement. Seriously, how can every single store on the Citadel be his favorite? The simplest explanation is that it's a video game, and giving the store a highly marketable nod of approval is something that comes up on the dialogue wheel whenever Shepard talks to a clerk. In return, you receive a discount on your purchases. It's obviously sensible and entirely beneficial to endorse all space shops. The video game you're playing simply does not care. Me? I'm really bothered by this stuff. My version of Commander Shepard is a virtuous, considerate man (sorry, Jennifer Hale fans!) who often confuses honesty with bursts of rash action (usually flying out of a pistol). He's endorsing one store, and that's final. I don't want people to think he's some sort of fame-grabbing Zap Brannigan type, you know? So, Mass Effect 2 is "immersive," then. Yes, I know -- it's that word that falls out every time a game reviewer shakes the vocab bag when he or she encounters elaborate presentation and an inescapable sense of time and place. 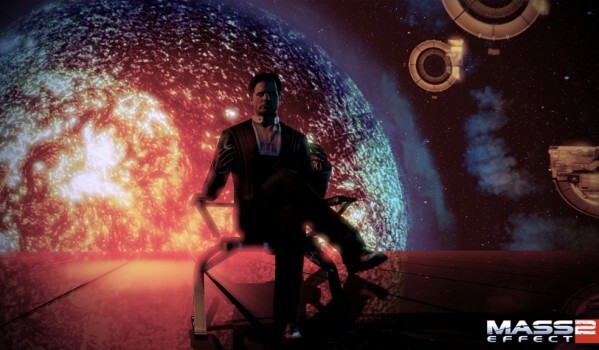 Mass Effect 2 is just like that, by the way, but the immersion isn't about being convinced that you're someplace else. It's about caring -- giving a damn about the fake people inside your LCD screen. Mass Effect 2 is a game for those of us who like to entertain the rather whimsical notion that a fictional world has some sort of permanence, even when you turn your attention to something else. It's the belief that even while you're standing in front of the mirror, squeezing a pimple, Miranda's doing research and Garrus is still adjusting relays or whatever he does in the bowels of the Normandy. BioWare has made a deliberate, serious and herculean effort to cover up the ugly truth: when you walk away, the universe turns off all the lights, and everyone explodes on a pixel-ecular level. In jettisoning the original Mass Effect's chunkiness, staccato combat and overburdened inventory, BioWare hasn't dumbed down -- they've edited. There's a smart, exhilarating shooter here, but it's the polite usher that shows you to your seat before the real show begins. It's what gets you to the payoff, something in which you can truly participate. When I described Shepard earlier, he wasn't based on what BioWare had written and he certainly wasn't based on a grand plan I had before loading the game. He's virtuous, because I try to make decisions that feel morally correct, independent of laws and cemented attitudes. After all, working for Cerberus grants me that opportunity at every turn. I know he can make spontaneous and poor decisions, because one of the game's ingenious Renegade actions prompted me to act impulsively -- I shot some lady who looked like she was pulling a gun. That could have been a serious mistake, but I didn't get EVIL POINTS for it. Stubbornly binary moral systems don't have room for believable characters who make mistakes, which is another triumph of Mass Effect 2's approach to role-playing. And we haven't even gotten to the game's most unique and inescapable quality: it's a proper sequel. The first Mass Effect made a very bold promise. "I will remember all of your decisions and pass them along to the next game." 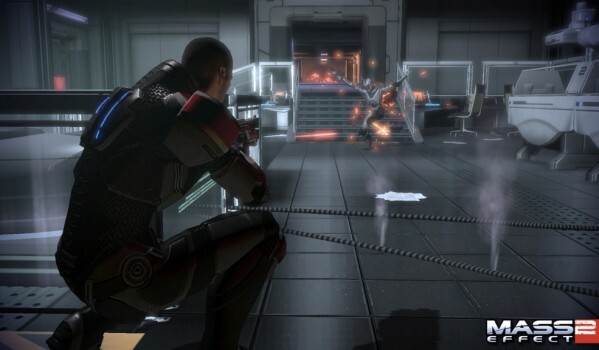 A transferred save file is fictional permanence instituted through technology, and BioWare's delivery on that years-old promise was the most crucial act in continuing the story of Shepard and everyone he met and/or shot. In other words, Mass Effect remembered everything and Mass Effect 2 proved that it did. Posed as the unsettling act of preparation for an unbeatable task, the main mission in Mass Effect 2 takes that early promise and warps it into the most menacing threat a game can manage. After the game has instilled you with confidence in its carry-over claims, it whittles that away with thoughts of a Mass Effect 3 without some of your favorite characters. What if Garrus doesn't make it? What if Tali's mask shatters in an unforeseen shootout? Mordin! No, I will not lose Mordin. I won't even mention the specifics of the mission, but I think you can estimate its gravity when you consider that not one, but two games are built around it. Having kept its promise and delivered its threat, BioWare has created the most worrying, exciting and shocking sequence in a video game. It's a shame that you can't ever relive that feeling once you complete it, and an even bigger shame that most games won't even try to replicate it. You've probably seen Mass Effect 2 being likened to The Empire Strikes Back -- the middle chapter that sees its heroes at the lowest point of their lives, moments before rising to victory. That comparison, while apt, might just rob Mass Effect 3 of some of its impact. I wonder, can it be a better game than its predecessor? Only if BioWare keeps both its promise and its threat. What if I made a choice this year that dooms humanity in 2011? What if the stormtroopers kill every last Ewok? Joystiq has revealed its 10 favorite games of 2010 throughout the week! There's a huge list of games that didn't quite make the cut, so stay tuned for more personal staff choices throughout the day in our Best of the Rest series.